Aircraft are a major threat to submarines because they have no air defense. Long-range anti-submarine patrol planes and helicopters can loiter around dropping sonar buoys as though casually fishing, while sophisticated billion-dollar submarines hide like fish awaiting death from above. Since modern submarines can fire cruise missiles while underwater, it is amazing that Sub-Surface-to-Air Missiles (SUBSAMs) have not been developed, although rumors persist that they secretly exist. The idea was tested in the 1980's using SEACAT missiles. The Soviets also tested the idea: Soviet SUBSAM. These tests failed because they used infrared seeking anti-aircraft missiles, which have a very limited ability to find targets. This is why they are usually aimed by the shooter and "locked-on" to a heat source prior to launch. 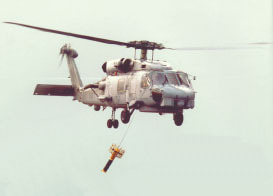 Submarines need SUBSAMs to shoot down or scare off anti-submarine aircraft like P-3 patrol planes (above) and helicopters like the SH-60 Seahawk (left). Submariners know when anti-submarine aircraft are searching nearby but they cannot get a precise fix. What they need is a missile that can acquire its own target, like the AMRAAM air-to-air missile, which uses an internal radar. 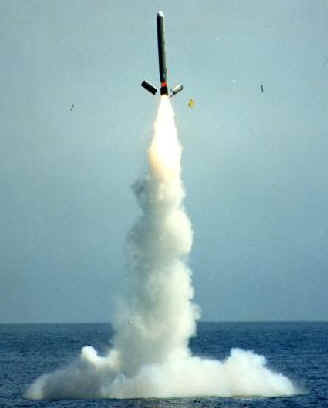 The BGM-109 submarine-launched Tomahawk missile (below) could carry a 335 lb AMRAAM instead of a 1000 lb warhead. A SUBSAM would have two stages, like the SUBROC missile, fired straight up and then level off to fly a pre-programmed search pattern over the submarine while the AMRAAM operates in the seek mode looking for airborne targets for up to an hour. Once a target is detected, the AMRAAM fires and breaks away from the cruise missile to pursue the aircraft. Submarines should not give away their presence attempting to bag an aircraft unless they have already been detected. If a submarine successfully stalks a fleet and launches torpedoes, its general location is known as it makes an attempt to escape. Therefore, submarines may routinely launch SUBSAMs after firing torpedoes to cover their escape. Anti-submarine aircraft would notice the Tomahawk launch and probably flee the area. A submarine detected by aircraft is extremely vulnerable, but a roaming SUBSAM should keep aircraft away for up to an hour as it flies an 8-track pattern over the area until its fuel is depleted. Meanwhile, the submarine has plenty of time to escape. On the other hand, inexperienced or aggressive anti-submarine pilots may continue their hunt after they see the cruise missile fly away, and face death a few minutes later as the SUBSAM returns during its pre-programmed search pattern. SUBSAMs may also be used offensively against airbases. A Tomahawk missile striking an airbase may damage aircraft on the ground with luck. However, a SUBSAM flying a pattern over a busy airbase may find something to shoot down. They may also be fired at distant aircraft carriers while attacking a fleet with anti-ship missiles to down aircraft and distract fighter pilots as they try to shoot-down the incoming anti-ship missiles. SUBSAMs do not require new technology, just the combination of two proven missiles.